The way stress affects footballers and how well they perform can now be measured using artificial intelligence, according to scientists. Understanding how mental pressure changes a player’s performance could affect how their training should be adapted and impact transfer fees. 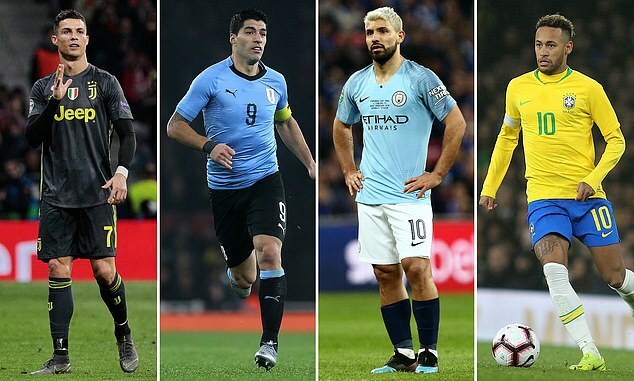 The researchers found that while Cristiano Ronaldo and Manchester City striker Sergio Aguero thrive in high-stakes situations, Barcelona’s Neymar Jr and Luis Suarez are more likely to crack under pressure. Researchers from the Katholieke Universitet Leuven in Belgium worked with data intelligence company SciSports to develop the computer programme. By working out how important a match – or moment in a game – is, and how the player performs in that moment scientists could establish exactly how stress affects them. The model analysed 7,000 professional games to break down pressure levels leading up to the match and a minute-by-minute analysis of how players were coping. It could break down a decision – such as whether a player chose to pass or shoot in the final minute of a game – and decide whether it was a good or bad choice depending on how well it was executed and the effect it had on the game’s outcome. ‘Mental pressure has already been extensively studied in sports such as baseball and basketball but in football this is uncharted territory,’ said Professor Jesse Davis. Chronic stress can cause you to make risky decisions like picking a job with a good salary but strenuous hours, say scientists. Researchers at Massachusetts Institute of Technology in 2017 identified the part of the brain that becomes impaired under stress and leads to poor decision-making. The study showed that stress leads to a sort of mental confusion between choices that will or won’t be rewarding, and can last for months. Experiments on rats and mice found stressed out animals were far more likely to opt for dangerous alternatives in the hope of a bigger reward. They identified impairments of a specific brain circuit which caused this abnormal decision making. Normally, when the circuit is turned on, neurons of the prefrontal cortex activate brain cells called high firing interneurons, which regulate how the mind weighs up risk and reward. But, when the animals are stressed, these circuit dynamics shift and the cortex neurons fire too late and brain cells then become overexcited. This results in abnormal decision making. According to its authors, the study – published in the journal Cell – findings could lead to treatments for anxiety and depression, and reducing the effects of stress to help people avoid bad decisions. ‘That’s why we have developed a model that uses machine learning to estimate how much mental pressure is experienced by the player in possession of the ball. During the study they found certain players could rise to save the 89th-minute penalty or score a tie-breaking goal in a cup final. But others might suffer a crisis of confidence or lose some of their skills in the heat of the moment. The study also found Chelsea player Eden Hazard struggles to perform under pressure and ends up making worse decisions. Manchester City midefielder Kevin De Bruyne performs well under pressure, it said, whereas Barcelona’s Ousmane Dembélé makes good decisions but his skills suffer. England and Tottenham Hotspur midfielder, Dele Alli, was deemed to do particularly badly in the face of stress, with both his decision-making and skills suffering. ‘The most ideal scenario is for professional football players to have a stable performance, regardless of the pressure,’ said SciSports researcher Jan Van Haaren. ‘Our analyses show, for instance, that Portuguese star Cristiano Ronaldo is oblivious to pressure: his performances are constant. The scientists who did the research say the findings could be used by coaches and managers to determine how players can best be trained and to consider when deciding how much to buy or sell players for. The research will be presented at the MIT Sloan Sports Analytics Conference in Boston later this week. Luka Modric Real Madrid Lower Lower Lower Modric’s performance decreases under pressure. Karim Benzema Real Madrid Lower Lower Higher The frequency of his shots decreases under pressure. Lionel Messi Barcelona Same Same Lower Messi performs in every situation. His decision ratings are lower in high-pressure situations, but that might be because he’s capable of bringing difficult actions to a succesful end. Gerard Pique Barcelona Higher Higher Lower Gerard Piqu? shines under pressure with a very high offensive contribution when the pressure mounts. Mario Mandzukic Juventus Same Same Same Mand?uki? is not affected by pressure. Kylian Mbappe Paris Saint Germain Same Same Same Mbapp? is not affected by pressure. Edinson Cavani Paris Saint Germain Lower Same Same Weaker at scoring in tense situations. Vincent Kompany Man City Higher Higher Higher No clear difference in defensive actions, but his contribution from offensive actions increases significantly in high-pressure situations. Kompany’s execution is rather low when there is lack of pressure. Raheem Sterling Man City Lower Lower Higher His shooting skills decrease while under pressure. Romelu Lukaku Man United Lower Same Same When the pressure is low, Lukaku is among the strikers with the highest contribution in the Premier League. In high-pressure game situations, his contributions are rather average. Paul Pogba Man United Higher Higher Higher Pogba performs better under pressure. His contribution ratings increase, especially due to his passing. Mohamed Salah Liverpool Lower Lower Same The contribution ratings of all his action types (including passes, dribbles, shots) decrease when the pressure mounts. Trent Alexander-Arnold Liverpool Higher Lower Higher Alexander-Arnold has a higher contribution while under pressure, due to his offensive actions. Olivier Giroud Chelsea Higher Same Lower Giroud is a real clutch goal-scorer. His contribution from shots doubles in tense situations. Willian Chelsea Higher Higher Same Willian shines under pressure. Mesut Ozil Arsenal Higher Lower Same In contrast to popular belief, we could not find proof of Ozil choking under pressure. Granit Xhaka Arsenal Higher Higher Same A high contribution from shots while under pressure. Jan Verthonghen Tottenham Higher Higher Same Among the best defenders when the pressure rises. No clear difference in his offensive contributions. Harry Kane Tottenham Same Lower Lower Kane takes his responsibility in high-pressure situations. He claims possession more often and, by consequence, more actions fail (lower execution). On the other hand his contribution is very high, regardless of the pressure level.